A guaranteed man pleaser! 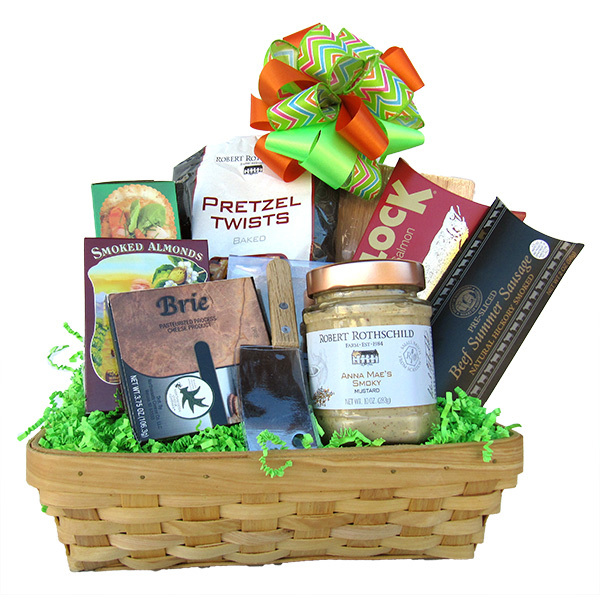 Sausage and Cheese Gift Basket contains a stick of Beef Summer Sausage, a round of Smoked Gouda Cheese and Brie and is accompanied by our favorite Anna Mae’s Smoky Mustard, Flavored Water Crackers, Smoked Salted Almonds and Seasoned Pretzels. All presented in a Split Wood Basket with a Cutting Board and a Wooden Handle Spreader for the Mustard and Cheese.